We lost our precious Zula, last spring. 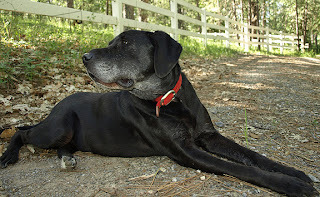 She was the PERFECT dog for us. She was sweet and calm, but also big and black and scary to strangers. She really barked and protected us. 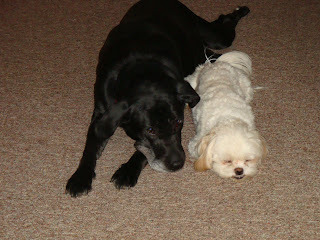 She also played and took care of our little Pookie. We called her the "babysitter". When we brought Pookie home as a puppy, Zula adoped him right away. He slept with her, played with her and she would even let him steal a treat right out of her mouth. Zula was perfect. She can't be replaced. But, we do need a big dog. We live in the country and I just feel safer with an outside dog watching over us and our place. Ever since last spring, we talked and talked about getting a new dog. We even went to the pound to get one, but they had this crazy policy that just wouldn't work for us. You choose the dog you want and then you show up on a certain day and they do a lottery for the dog with anyone and everyone who is interested in that dog. We did this one time and did not get the dog. Who has time to go down over and over hoping to get a dog? So, we just gave up. 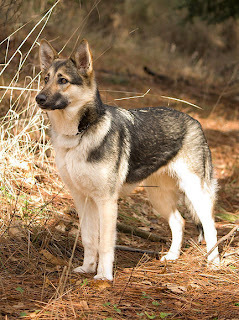 Then a couple weeks ago, I was looking at my favorite blogs and while I was on Donna's blog, anenchantedcottage, she had a button on the right that said "adopt a dog". I clicked on it and found the animal shelter in my county with lots of pictures. The animal shelter I went to before is in the next county over where I spend most of my time. I decided to try the one here in my own area and we found Pepper on the first visit. We had to wait a few days to pick her up, but she was ours the minute we made the committment! Turns out, she is a really sweet dog. She is 7 months, so still a puppy. She thinks that Pookie is a toy and he liked playing with her at first, but now it's a bit much for him. I saw her grab his harness by the mouth and swing him around....fun for her...for him...not so much! We got it yesterday and already, she is already comfortable with it. What a good doggie. She cries a little and then stops. This is my daughter with Pepper. She lets Pepper and her dog, Foxy run in the fenced in garden. They are a really good match and it's fun to watch them go. Can you see Foxy hiding up the stairs? We are so happy to have Pepper. And, she is one lucky dog. This place where we live, is truly dog Heaven! A special thank you to Donna, this wouldn't have happened without you!! You are Pepper's fairy godmother! 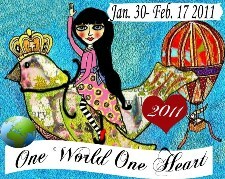 I'm so excited...it's almost time for One World One Heart. This will be my 3rd year to participate and it will also be the final year. It's a wild time of visiting blogs all around the world. Each blog that participates has a giveaway. Usually the giveaway is a hand made art or craft. I have several treasures from OWOH that are so special to me. I still don't know what I am going to give away, but I want to make it something really great. You can read all about it by clicking on the picture above. Get ready, it's going to be a wild ride! It's a brand new year and I am making a brand new start. I am clearing out 2010 and putting it behind me. There were many wonderful things that happened in 2010. The biggest for me was being in the band. It started out as something small and grew into a very large part of my life. I even have a blog dedicated to it: stephaniesbandblog.blogspot.com . I learned a lot and had so much fun. There were so many fun shows that it's hard to point to a favorite. We played for 2 county fairs and 1 festival. We played for many wineries and out door venues like "music in the park". We also played for private parties and those are always fun. Of course there are the restaurant/bar/pub shows that are also a blast. We are looking forward to an even better year and it's already shaping up! Another big thing is that my son moved to Seattle. It was a really hard and harsh reality for him and he learned so much. He changed a lot and all of it for the better. He is smarter and stronger and in a really good place right now. I'm so happy for him. My home based Isagenix business has been a steady source of income and I am so grateful for that. I look forward to putting even more effort in to that in 2011. And, of course, the Isagenix program has kept me healthy and happy all year....I can't even imagine life without it. It has given me the energy and health that has allowed me to do all the things that I wanted to do. I finished out 2010 with a surgery that I was not expecting. I had to have my gallbladder removed. I was super sad because I had to miss our New Year's show that I was soooo looking forward to, but it could not be helped. Darn. The surgery was a week ago today and I am feeling pretty close to normal. Wow. That's amazing. I am grateful for modern medicine and all those wonderful medical professionals that are there to take care of us when we need them. And, I am grateful for Isagenix, which I am certain had a big part in my speedy recovery. So, now, it's time to look forward. I have put together my new vision board and I'm still adding to it. It sits on the wall opposite my desk, so I can see it all the time. It has really changed my thinking. It's pretty much my mission statement in "images". I have lots of goals for 2010 and I have a feeling it's going to be a really great year.